As the Managing Director and Pastor for RLB Echad LLC, Jonathan guides an organization that (a) helps for-profit business leaders provide a way for employees to fully engage at work, by leveraging religious advisor services, (b) helps executive leaders balance their personal and professional lives and (c) helps non-profit leaders make sound business decisions. Jonathan received a bachelor’s degree in biology from Prairie View A&M University, after which he spent some time in the U.S. Navy. 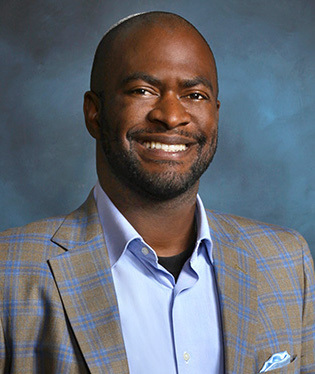 He worked at Frito Lay and then at Michelin before attending Washington State University College of Business where he studied in the Executive Master of Business Administration (MBA) program. Jonathan did his capstone (thesis) on what eventually became RLB Echad, a faith-based consulting organization. His extensive research included: leveraging pastoral models to improve employee engagement, pushing work-life balance to prevent burnout, and encouraging nonprofits to seek experts in business. Outside of RLB Echad, Jonathan Dade leads a congregation that: (a) serves Hebrew Christian, Torah Observant, Messianic Jewish, and Non-Religious Believers, (b) teaches principles on living a biblical lifestyle for spiritually-minded individuals, interfaith families, and non-religious couples, and (c) celebrates biblical feasts and holy days, keeps the seventh day Sabbath, and experiences the Holy Spirit. Theologically, Jonathan published The Church and The Community, pastored groups, researched the Scriptures, and received a Master’s of Theological Studies (MTS) from Colorado Christian University, with a passion (thesis) in Messianic Jewish apologetics, to a Christian audience. Jonathan, Melinda, Karissa (born 2011), Tristen (born 2012), the Rhodesian Ridgeback (Chaya), and a flock of mostly Buff Orpington chickens live in Georgetown, a suburb of Austin, Texas. Outside of Jonathan’s unifying work with Messiah Echad and RLB Echad, he enjoys road cycling, target shooting, and visiting local wineries, usually— safely—in that order. His wife (Melinda) enjoys DoTerra Essential Oils, art, reading, and teaching younger women. And together, they enjoy archery, cabin camping, canoeing, cycling, foster-adopt discussions, and visiting local wineries. Should you ever find yourself in Central TX, be sure to contact Jonathan and learn about RLB Echad. RLB Echad LLC is an ethically based consulting organization, which exists so that Religion, Leadership and Business may find Echad (Oneness). We provide business consultation and project management to non-profits, we coach leaders to grow their careers while maintaining healthy work life balances and we offer religious advising to for-profit organizations. Our goal is to be the most widely used business consultants in non-profit markets, the standard for religious or spiritual advising in for-profits, and an overall best place to work.